Smartphones without Chrome browser is hard to imagine. While most of the users browse the internet on their phone, it can become a cumbersome experience at times. To fill in the address or the search sometimes becomes a hassle. Thanks to Google, which always has a solution to our problem and thus provides an option to move it from top of the screen to bottom. This feature is accessible in chrome://flags menu which contains all the tweaks and settings which are in experimental stage. chrome://flags allows you to try new features which are in testing phase. Since they are in testing phase, it usually gives a warning before allowing the user to access the feature. chrome://flags menu contains offers many settings. However, for now we will only learn how to move the address bar to the bottom of your Android Chrome browser. To enable this feature, you need to perform the below mentioned simple steps. Typing “chrome://flags” will open Chrome flags page which contains all the different experimental features. In the Chrome flags page manually search, Chrome Home. To do this tap on the 3 dots on upper right corner of the screen and then tap on Find in page, for automatic searching. In the search bar type “chrome home” and hit enter. From Chrome Home Android section, open the menu by clicking on the tab where Default is written. From the list choose Enabled. Once you click on Enabled you will be prompted to restart the Chrome browser by tapping on RELAUNCH NOW button. Your browser will restart and address bar on your browser will move to the bottom. Note: If you do not see the change then force stop Chrome and restart it again, it should do the trick. When enabling it you will receive a warning about using these experimental feature as it may sometimes give unexpected results. This new feature will make it much easier for users to browse internet. 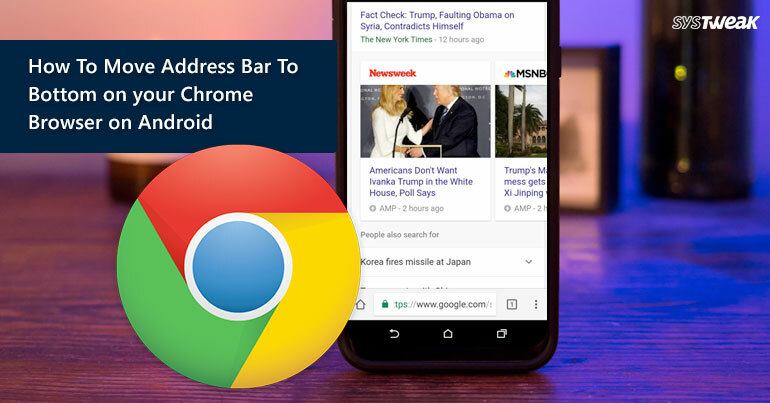 If you do not feel comfortable with having address bar at the bottom you can always revert to the old classic view of Chrome browser in which the address bar is located at the top.